07005 Regenerated 4th Doctor and (non electronic) Tardis Collectors Set. Please look out for site updates on availability. The tweaked 3 packs appear to have been reinstated to February after being put back until April. 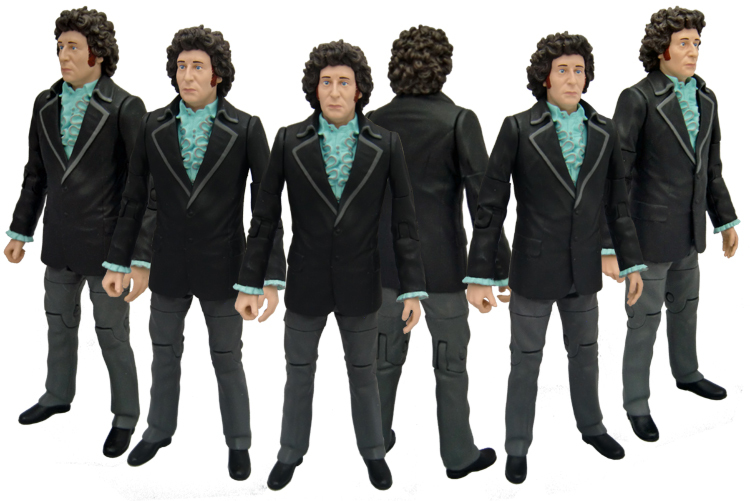 This Interim set is due around February 2019 – Regenerated 4th Doctor in 3rd doctors outfit with the 4th Doctor head from the ‘time capsule’ set but with new revised decoration. 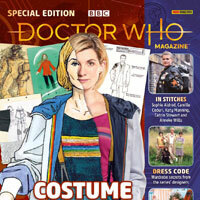 A further Tardis set is planned for later in 2019 along with more collectors sets. The 3rd Doctors Tardis set proved to be extremely popular. 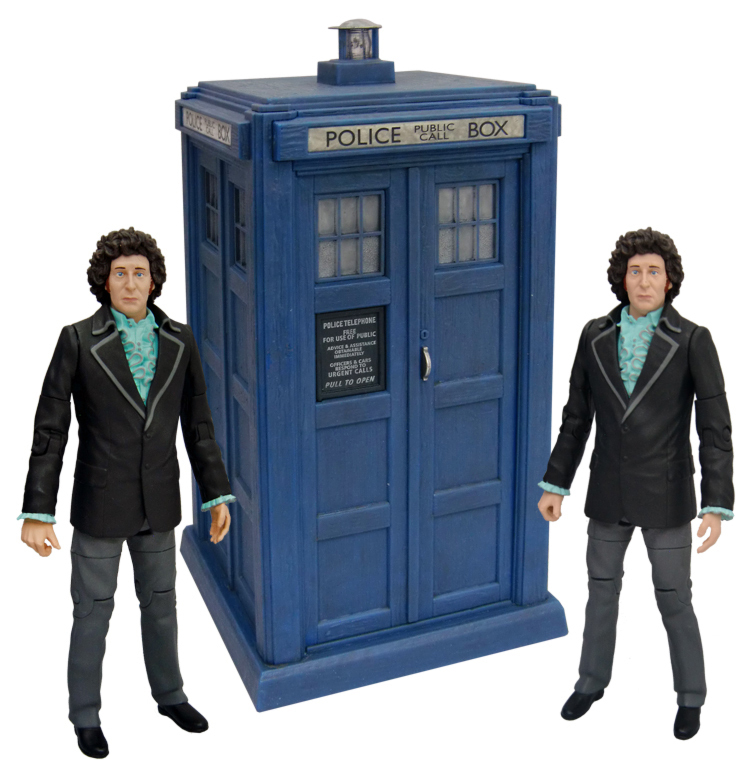 Exclusive to B&M this second Tardis set features the Regenerated 4th Doctor from Robot and a 4th Doctor’s Tardis. This comes in the new “Classic” style guide packaging now used on most new pre-13th Doctor items. 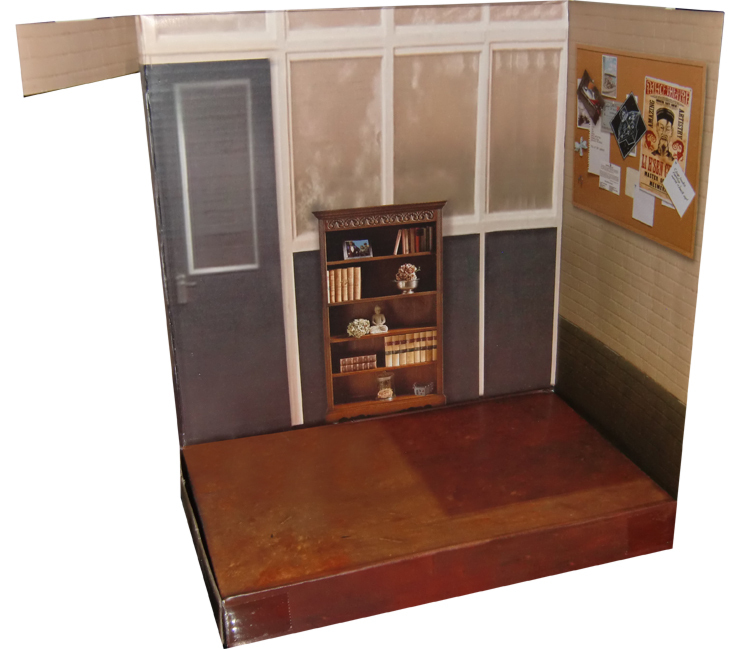 There is a printed background card in the box of the Unit lab with a bookcase and wall with various 3rd / 4th doctor related items pinned to a board, The floor is even a different colour where the Tardis stands. 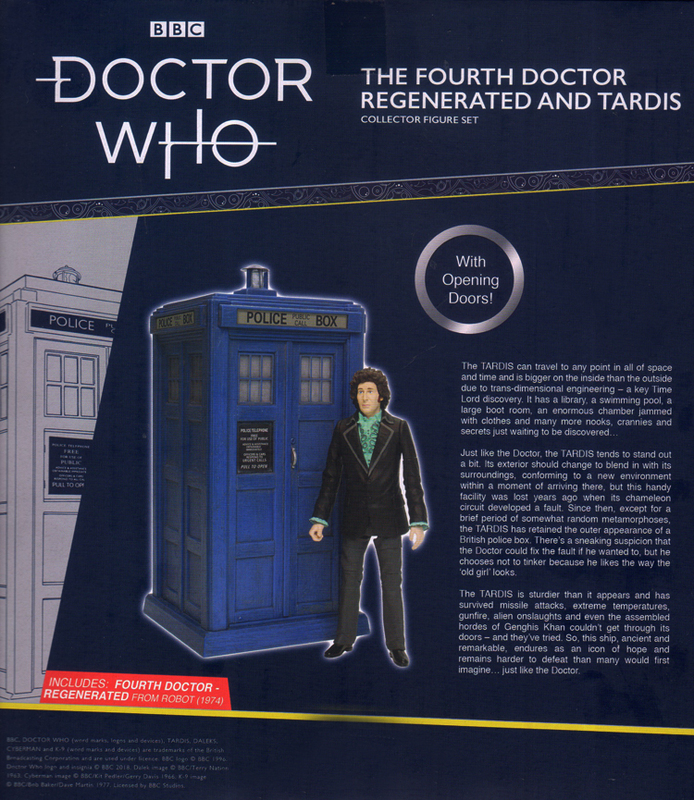 The regeneration figure was previously only available (in the UK) in the 50th anniversary time capsule set but this is a slight variant with updated decoration including whitish lining around the lapels. The Tardis has a different shade of Blue, updated door panel and a white background on the signage above the doors. The doors open as per previous versions. Looking at our Tardis Landings Page the white background appears in several outdoor shots including Terror of the Zygons and the Andriod invasion (which also looks closest with the lamp). 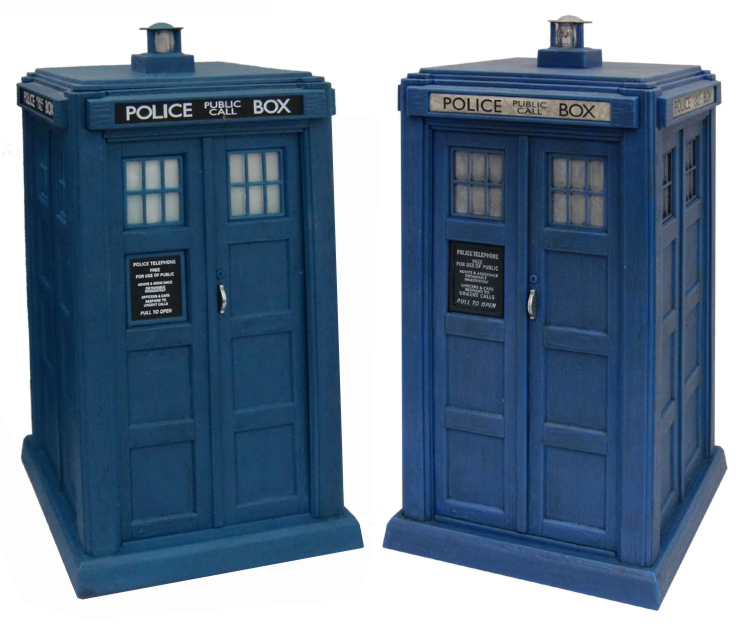 The original and now highly sought after 4th Doctors Tardis is on the left and new variant on the right. Some “weathering” has been applied to the signage, lamp top and windows to make it more screen accurate! 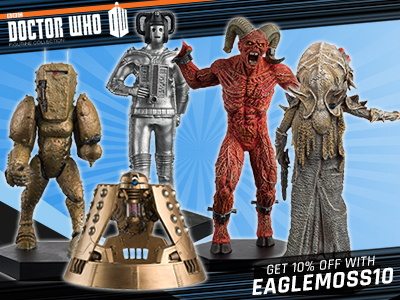 Figure aside, The Tardis is sufficiently different to make this another must have set. Looks amazing! 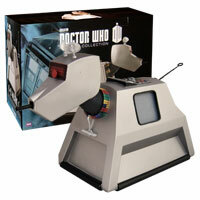 I’ve already got a regenerated 4th Doctor, the time capsule version, but this’d be good for customs. But that TARDIS is beautiful. I was going to make a custom “Three Doctors”/Season 9 box, but this should do the trick. And that box packaging looks absolutely gorgeous. Also, if they’re going into enough effort to redesign the packaging for pre-S11 products, maybe we’ll see more than just the three new B&M sets? I know it’s wishful thinking, but it’s possible. Are B&M talking to you again now Booboo? Why won’t they talk to you? Sites like this are free adds for them! I do like that backdrop very much. I think I will have to give in and get this hehe. This looks great, the figure and TARDIS are both improvements, but what really stands out about this to me is the new packaging and background, which look fab. Will definitely try and get this one. Hoping for a companion set or two. Just a dream but maybe B&M may do one in the future (I HOPE)! What could you really put in a companion set? B&M sets don’t have new figures in them or made for them. This looks great, thanks to B&M for keeping the range alive. 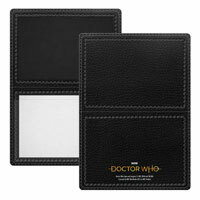 Remember there are 7000 of these sets about to hit the shelves, that’s 3000 more than the 3rd Dr & Tardis set. 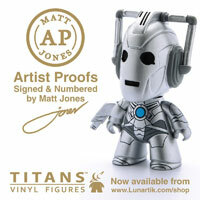 Don’t panic buy, you will get one if you wait as it will take a few weeks for the stock to reach all areas of the uk. The mad rush to find the 3rd Dr & Tardis set only caused the scalpers to bulk buy all the stock knowing it would sell for more on eBay. If people refuse to pay silly money then those that do inevitably end up on eBay should eventually fall to a reasonable price. Again a TARDIS that is 60% accurate. Base needs to be thinner, Lamp is just generic, not era specific. Colour is OK though. Will buy two, cut and change one to be more accurate. Keep one AS IS. People forget that these are “Budget” Releases!…. Character wouldn’t make any money if they had to sculpt a Brand New Tardis everytime a new one came out! Especially if it had electronics…. you’d be talking a lot of money to buy one! I’d rather have the approximation of one that looks really good and you know which Doctors it is and only pay about 15£\20£ for it. Booboo how did you get one? Is it an early sample? 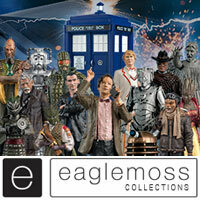 I might be being greedy, but I really hope B&M commission some sort of Dalek set. Or possibly more than 1 round of sets per year. They sell, and people want more! Same, Dalek Collectors Set 3 – Nation’s Red Top Dalek, Weetabix Dalek & Madam Tuessauds Dalek. 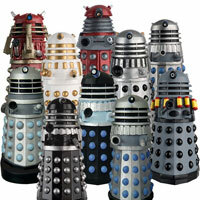 I’d love a Dalek set. I too would love to see this but I imagine it may be difficult due to the cost as the Nation Estate would (I assume) require royalties? When is the official reales date? Booboo I have a theroy, last year was the 3rd Doctors Tardis & next month is the 4th’s, do you think the summer releases could see a 5th Doctors Tardis? What is the background inside the box? There are no background inserts in the Classic TARDISes – never have been. Actually, that packaging background looks great. The TARDIS barely moved from that position throughout the 3rd Doctor’s era, so it’s certainly a good place to have it. What Easter Eggs are hidden on the notice board? I can see the Talons poster, but what else? there is also a picture of the 3rd doctor, the brig and jo on the book case as well as a poster from talons of weng-chiang. it is so nice to see, this i wish B&M would do this more often. The Whomobile, a picture of the inner workings of the TARDIS console, and that’s just what I can see. The more I look at the picture the more it grows on me lol. I wonder if this set is going to be any easier to get hold of than the last one, or will the scalpers snap them all up again, leaving the rest of us to fork out eBay prices? Shame B&M don’t have an online, or eBay, store! Looks a good decent set. I won’t bother looking for it though. They will no doubt be bought up by people selling them online for double the price again. 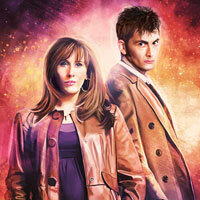 Looks nice, 4th Doctor looks a bit strange. I may pass on it as I have two of the fourth Doctor Tardis from the original release. So will the re-releases of the other sets be in new packaging as well? Can we live in hope they get in a decent supply this time around? Did not find that elusive third doctors TARDIS set anywhere local and beyond. I just gave up in the end. No way Was i paying those extortionate prices on Ebay. Again today there were at least six in the Colne branch in Lancashire. 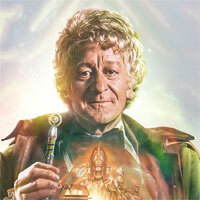 At first glance I thought that was paul mcganns face with Toms hair on a pertwee body. which prop from which episode? The model is the Thomas Yardley-Jones Tardis from 1980-1989, they have just cropped the roof so it won’t look accurate sadly. Yay can’t wait for this! Could this TARDIS be classed as a 3rd Doctor TARDIS or is the Regeneration set name a little misleading and more focused on the 4th Doctor figure? Will this be out in February still? 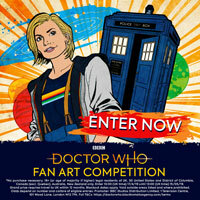 I can’t wait for this but also looking forward to someday owning Jodie’s TARDIS! Wonderful stuff! Cannot wait for this and the paint app variants! Doesn’t the TARDIS have a light up ‘white’ sign in the Ark in Space too – during the opening materialisation scene? Any pics of the other february sets? 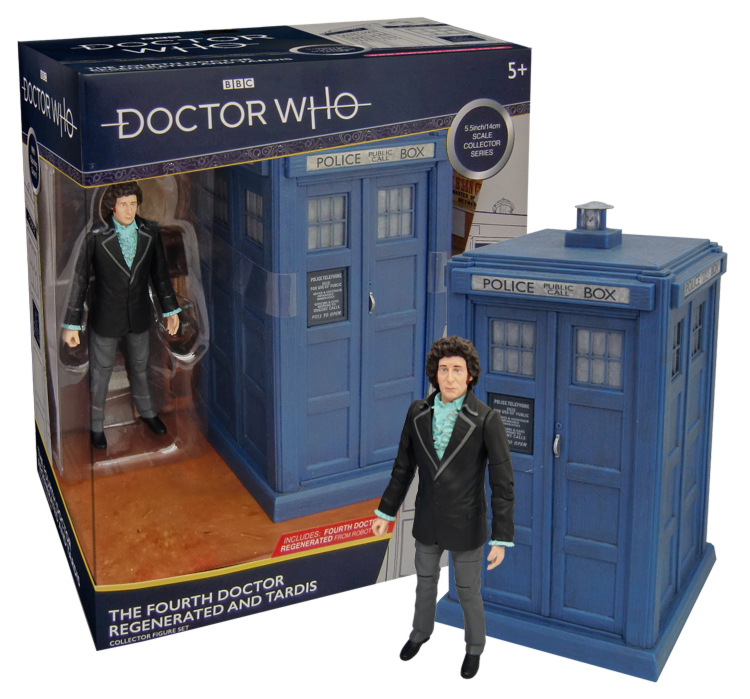 Really lovely set with great packaging and TARDIS, which is what makes so disappointing to me that they went for a regenerated Doctor (which I don’t like regenerated outfit Doctors and never collect any) instead of the lovely Third Doctor, (or even a better Fourth Doctor). This looks great, booboo do you have any larger images of the set? does it have UNIT HQ as a backdrop? great! it looks amazing! do we have a release date?